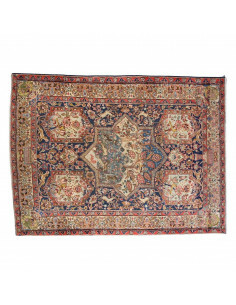 hand knotted carpets from the city of Tafresh in northwestern Iran. The rugs have a medallion pattern with red fields and stand out due to their short-wool breeds. Jozan Persian carpet with blue and floral design background, hand-knotted by artisans Persians, on the vertical frame, the warp and weft in cotton, wool and fine wool.